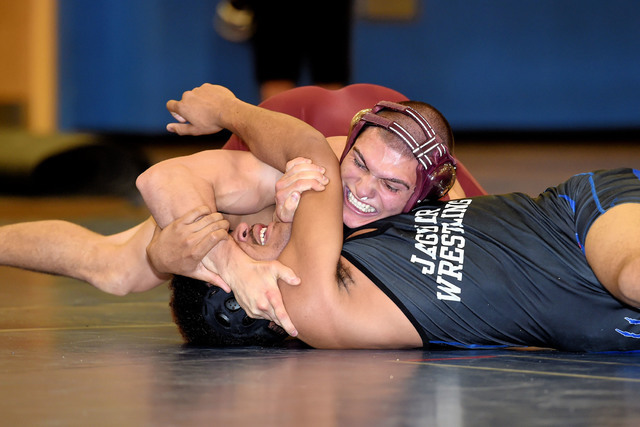 The Trojans wrestling team traveled to Desert Pines on Wednesday and took on a team with six seniors and did surprisingly well in their 39-30 loss. Peter Davis / Special to the Pahrump Valley Times Junior Dustin Rily (132 pounds) gets his pin at Desert Pines. The Trojans lost this dual, but it was close, 39-30. Peter Davis / Special to the Pahrump Valley Times Sophomore Dylan Grossell (132 pounds) gets his fifth league pin of the year to go undefeated in league at 5-0. Peter Davis / Special to the Pahrump Valley Times Junior Dustin Rily (152 pounds) gets his pin at Desert Pines. The Trojans lost this dual, but it was close, 39-30. The young team, without a single senior, got four pins from sophomore Dylan Grossell (132 pounds), who got a pin in 1 minute and 33 seconds, junior Dustin Rily (152) got a pin in 3:31, sophomore Christian Monje (182) got a pin in 50 seconds, and sophomore Jakob Landis (220) got a pin at 1:55. Junior Jeremy Albertson (195) got a forfeit. Despite the loss, Trojans coach Craig Rieger looked at the positives. He said Grossell got his fifth league win and his league record is 5-0. Tristan Maughan experienced his first league loss, but he is 4-1 in league. He said many of his sophomores wrestled well during the dual. The wrestling team will be working toward doing well at the 3A Southern Regional Championships at Western High School on Feb. 3. “It would have been nice to get another win, but the focus is now getting as many individuals to state,” the coach said. The Trojans finished league competition at 3-2.